Received a comment recently about one of the restaurants I reviewed. The person felt that I had misled readers of the said article and claimed that the food was not authentic enough. This commentator also disagreed with my comment about the fish dish...with all due respect, it's ok by me to critique my writing. I just don't feel it is justified to judge restaurants or dishes too harshly - yes, we pay to eat and have every right to eat decently. But passing remarks or discussing it with close friends and family are acceptable - after all people's memories are short and verbal negative comments are somewhat easier to forget. Not when one is doing food writing or reveiws though. I soon learn quickly that the pen is indeed mightier than the sword when I started my food writing and restaurant review stint. Like the famous saying from Spiderman, "With great power comes great responsibilities...", those of us who are entrusted to write about food realise we have to walk a fine line between being honest and upfront for the sake of being credible, and being diplomatic and allow room for some of the outlets' misdemenours. While it is all too easy to be 100 percent judgemental and call a spade, a spade - those of us who are life long learners in food, cooking, buying, experimenting and eating - will emphathise with the chefs and owners also on the need to live up to the public's expectations. Constantly and consistently. Being human beings, we are imperfect so there will be times when things go wrong and dishes, service, ambience, etc. do not turn out the way one has anticipated or expected. "Nobody ever open a restaurant to serve bad food" is another motto that I kept very much at heart. Which is so true isn't it? Opening a restaurant takes guts, money, passion, time, labour & 101 things that we won't know about if we are not in the business. Like they say, you won't know how I feel until you have walk a mile in my shoes. So I don't think I have the right to pass a death sentence on any restaurant or chef for that matter - the food may be mediocre or not up to scratch or not to my liking...I prefer a live and let live attitude cos someone else may find the food is acceptable, just to their preference or taste - there's just no accounting for different tastebuds or palates. One man's meat is another man's poison remember? Now back to my reviews...I will comment on the food but really that remains my personal opinion. I try as much as possible to relate the personal aims, dreams and ambitions of the restaurants' chefs/owners on why they choose to be in the business or what drives them to create a particular dish. But what I refuse to do is to run them down or be downright harsh on them - just because I don't like the taste of the spaghetti or reckon the fish is not cooked properly? When it comes to food there's no wrong way or right way - just like wine tasting, go for what you like. It's all personal in the end so what's the point of being too serious about it? I prefer to let readers form their own opinion and draw their own conclusions. Even with food creators, outlet owners and operators, I always tell them it's not my review that will draw in business for them. It's their own efforts, hard work, food quality, taste and consistency that will win people over. Now isn't that great food for thought? You tell me. Ipoh has always been famous for its silky smooth ‘hor fun’ (thin, flat rice noodles), crunchy beansprouts and delicious chicken rice. 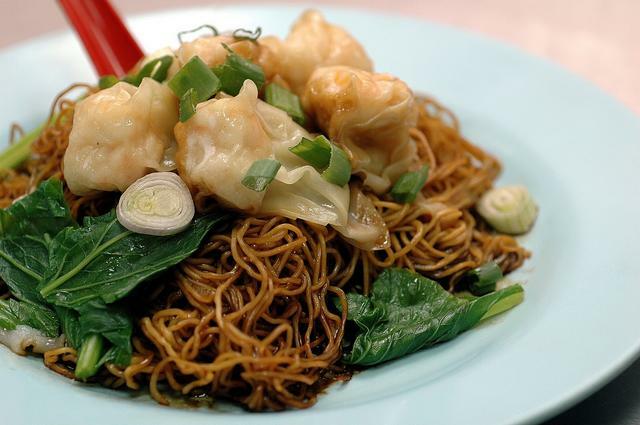 But if you are residing in KL and Selangor, why not enjoy these traditional Ipoh delights at Restoran Chan Thoong Kee? This unassuming outlet serves possibly one of the best tasting Ipoh ‘hor fun’ that I have ever eaten. 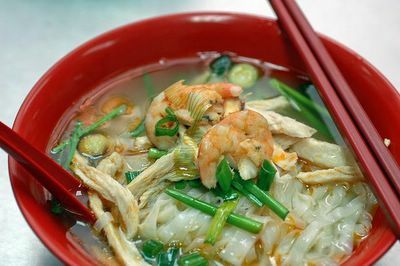 The smooth rice noodles can be enjoyed in flavourful, clear chicken broth with shredded chicken, sliced prawns and aromatic Chinese chives or dry-tossed with superior grade oyster sauce. Priced at RM4.00 (small) and RM5.00 (big) per bowl, I can assure it is worth every ringgit you pay for it. What made the ‘kon lo’ noodles so distinctive is the use of superior grade oyster sauce that is imported directly from Hong Kong. Redolent with the enticing aroma of dried oysters, its slightly sweeter formulation complements the thin strips of bland rice noodles very well. 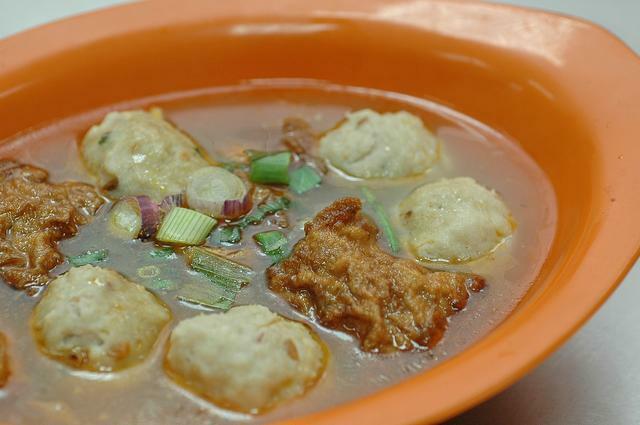 Savour the fresh prawn ‘wan tan’ (RM6.00 small, RM12.00 large) here - the dumplings consist of whole prawns that are springy to the bite, a testament to their superb freshness. My parents and hubby always go for the ‘wan tan’ mee or egg noodles (RM5.00 small, RM6.00 big) in soup or tossed with dark soya sauce and fragrant oil. Their nice, mildly chewy texture do not have the usual chalky smell or taste of ‘kan sui’ (lye water). Additional side dishes to sample include beancurd rolls (deep-fried rolls of beancurd sheets filled with fish paste, RM1.00 per piece) and cuttlefish balls (a mixture of fish paste and finely chopped dried cuttlefish, RM1.00 each). If you are a 'farn toong' (a die-hard rice eater), the Hainanese chicken rice (RM4.00) is highly recommended. The rice is tasty and fragrant without being overly greasy and will leave you wanting more with the smooth, succulent steamed chicken. Diners can also order ‘tong sui’ or sweet dessert broth from the adjacent Foong Wong Café to end their meal. Freshly made on a daily basis, the sweet broths available include ‘foo chok yee mai’ (barley with gingko and bean curd sheet), red bean soup, ‘tow foo far’ (soft beancurd dessert), sweet potato in sugar syrup and sea coconut with longans. All the ‘tong sui’ broths are priced at RM1.80 per bowl except for the sea coconut with longans which is served at RM3.00 per bowl. I truly believe the outlet’s consistency in maintaining its food quality and great value-for-money will continue to draw us and legions of their customers back. Other Chan Thoong Kee branches are located at Berjaya Times Square and Jalan Hang Lekir, Kuala Lumpur. Small cake that's big on taste - guaranteed to make you break out in song! Char-grilled NZ Steak at its best! It's hard to imagine a good steak is best savoured without sauce. But here's what Somerset Grill is advocating. The owner, Augustine Kow, who has spent his tertiary education years in New Zealand, is keen to educate local palates on the fine art of appreciating steaks on its own. Using prime cuts of NZ beef and lamb of course. 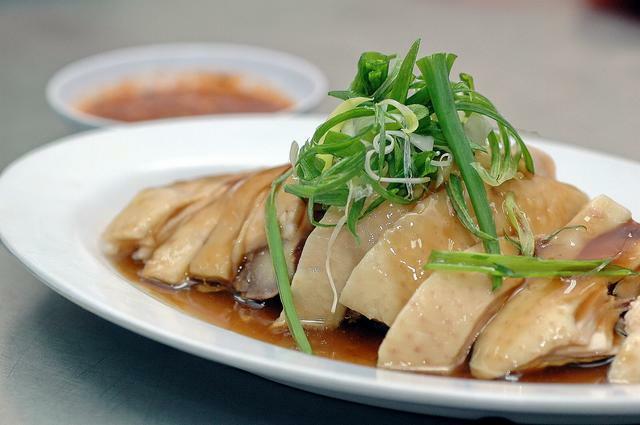 Kow's personal interest and inherent talent for cooking and eating probably stems from his Hainanese background. His father was a cook and used to work for Federal Hotel in Kuala Lumpur. But it was not until recently that Kow has the chance to pursue his interest in food - bread and butter issues took precedence as he focused his energy on building his jewellery and watch business. With Somerset Grill, Kow is aiming to recapture the fond memories of great steaks that he had in NZ. Here the beef and lamb are marinated or ‘aged’ for a day or two with specially concocted herbs and spices, based on recipes that he has kept with him for the past 20 years. The chefs are trained for 3-6 months on the finer rudiments of using the charcoal grill to produce varying degrees of doneness for the steaks. Opened about one and a half years ago, Somerset Grill is located along the busy main road leading into the residential area of Taman Tun Dr Ismail. The outlet has a relaxed and friendly ambience about it. Several beautiful Tiffany ceiling and standing lamps make for interesting conversation pieces whilst you wait for your food to arrive. For the prices that you pay here, do not expect fine-dining service but the young wait staff is alert enough to ensure diners are promptly attended to. Light eaters can opt for the Augus goulash (RM9.90), a hearty lamb stew that is cooked for over three hours with lots of root vegetables and fragrant herbs, or their delicious pies – Marco Polo (filled with chunky chicken, melted cheese, diced vegetables and spices, RM9.90), Sinbad’s Diet (fish, tuna and crabmeat pie) and Nemo’s Choice (salmon pie, RM9.90). 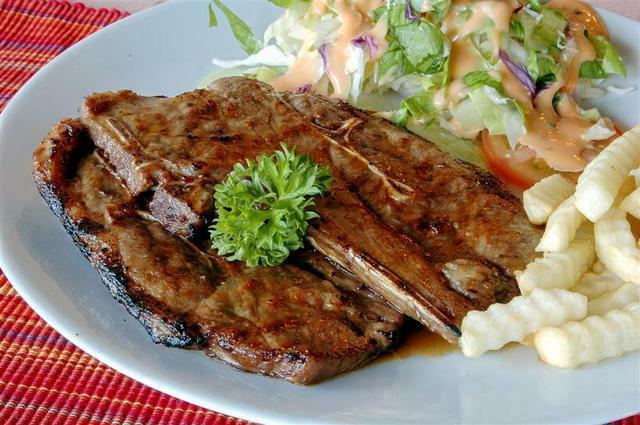 The best-selling items are the Somerset Rib Eye (RM33.90) and the Augus Lamb (RM21.90). 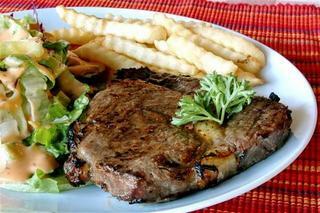 When the steaks were served, we were already salivating after inhaling whiffs of the dishes’ mouth-watering aroma. The Somerset Rib Eye is quite substantial. We had asked for it to be medium rare and it turned out exactly to specifications. Extremely tender and moist with a delicate briny after taste, the meat has a splendid smokiness in it. Don’t turn your nose up on the side dishes as the simple salad of shredded lettuce and cabbage actually complemented the steaks very well. For those with a penchant for lamb, the Augus Lamb is splendid with its elegant peppery and slightly nutty nuances similar to that of a refined, well-marinated lamb ‘satay’. Other equally salubrious choices include the Somerset t-bone steak (RM38.90), Somerset sirloin (RM32.90), Somerset Bay char-grilled salmon (RM23.90) and Somerset Valley spring chicken (RM18.90). 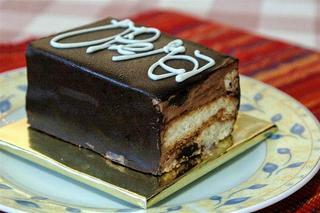 Dessert mostly consists of cakes in singular servings. The Opera cake (RM8.90) is irresistible with layers of coffee almond cream alternating with Japonais biscuit mix whilst the Chocolate Exotica (RM9.90) is an indulgent treat of French chocolate mousse and hazelnut paste with a soft-centred filling of chocolate praline. If you prefer something slightly fruity, sample the Oona Apple Pie (RM6.90), a Swiss apple pie with cinnamon and raisins or the Apple Cheese Cake (RM9.90), a rich cream cheese cake with apple dices. The remaining sweet treats include Cappuccino Corretto (RM8.90), Hungarian Walnut (RM7.90), Felchlin Caramel (RM9.90), Mocha Glory (RM6.90) and Mississippi Mud Brownie (RM6.50). Somerset Grill definitely makes the cut if you want to enjoy a good steak and other Western-style dishes without having to spend a fortune. Meet Ahmad Rasly Hj Osman and his wife, Sandy who are determined to offer genuine and affordable Thai food in Kuala Lumpur. Having worked in Bangkok for the past six years, the couple were often told by the many Malaysian friends who visited them that it is virtually impossible to find delicious yet reasonably priced Thai dishes back home. So upon their return, Rasly decided to open Baan Khun Li (‘baan’ means house, ‘Khun’ is the Thai honorific for ‘Mr’ and ‘Li’ as in Rasly) which translate into 'House of Mr Li'. The outlet itself is simply decorated with a Thai statuette at the main door, and some dark wood accents and Thai woven fabric hangings on its walls. Warm mood lighting that lends the place a cosy feel. Most of the outlet's specialties are culled from Sandy's collection of recipes with the balance coming from their chef. 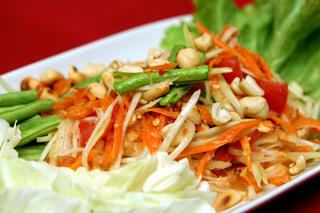 You must order the green papaya salad (RM8) as a starter to whet the appetite with its tantalizing tartness. Then go for the tom yam seafood (RM14-small, RM22-large) which is guaranteed to bring a tear or two to your eyes and awaken your palate with its robust spicy and sour nuances. It also has a lovely creamy finishing from the addition of coconut milk whilst squid, prawns, sliced fish, oyster and button mushroom complete this mouth-watering concoction. 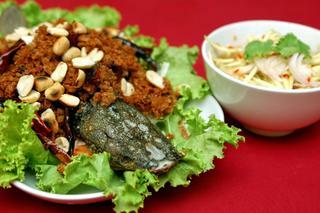 If you are looking for something different, deep-fried catfish with mango salad (RM12) is a good bet. The outlet uses fresh catfish bought from the Sunday Thai market in Petaling Jaya (outside the Siamese Buddhist Temple) specially to make this dish. A painstaking dish to produce, we were told the catfish needs to boiled, deboned and flaked before it is deep-fried over high heat with dried chilli. As a result, the fish flakes turn out nice and crispy and are served with roasted peanuts and a bowl of salty, spicy and tangy mango salad. Yummy! Other enjoyable dishes include deep-fried seabass with Thai chilli sauce (RM25), fried chicken and herbs (RM10), Massaman bef curry (RM15) and steamed seabass with garlic and chilli (RM25). The Massaman beef curry here is light and creamy with tender and chunky beef pieces, potatoes and ground peanuts. 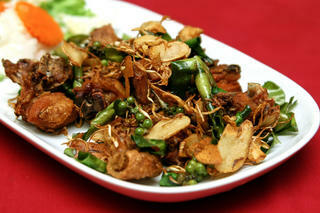 Although the fried chicken with herbs was a little nondescript at first, we eventually found that it tasted quite superb when both the chicken and the mixture of deep-fried garlic slices, strands of tiny green peppercorns, shredded ginger, lemon grass and kaffir lime leaves are eaten together. Desserts were sold out the evening we went to Baan Khun Li but I found they usually serve Thai cendol and ‘tab tim krob’ or chilled waterchesnuts dices in coconut milk at RM5 each. So now what are you waiting for? Go on, head over to Mr Li’s house for a real Thai home-cooked meal. The outlet can seat up to 60 persons inside and 40 persons outside at the patio area.